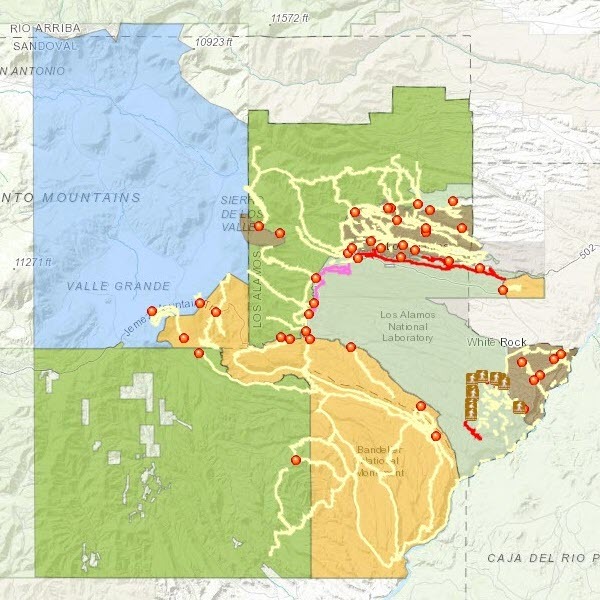 Continued access and use of Los Alamos National Laboratory trails is contingent upon being good stewards of these federal lands. Recreational trails use at Los Alamos National Laboratory has always been highly valued as one of the benefits of working and living in Los Alamos County. Laboratory trails are uniquely located on Department of Energy (DOE) land. Continued public access is conditioned upon treating the land and its resources with care and consideration. Please continue to notify the Trails Management program of any concerns about the trails. Trail users should not attempt to clear downed trees or other major obstructions on any Laboratory trails, as the trails are on DOE land and some trails present unique hazards, which are posted at each trailhead kiosk. Input on trails from trail users is paramount to successful maintenance and care of the trails. To report a trail condition or concern or to contact the Trails Management Program, email trails@lanl.gov. Some Laboratory trails are open to the public whereas others are only open to Laboratory badge holders. Some trails allow dogs, horses, and bicycles while these are prohibited on other trails. It is your responsibility to understand the rules of a particular trail. Trails are open from dawn to dusk, however trails and trail segments shown in red on trail maps are closed to all entry. Hike open trails at your own risk; carry water, and beware of weather conditions, hazards, and wildlife. Please leave no trace and pack out your trash. Laboratory trails in the White Rock area (TAs 70/71) are actively patrolled by Bandelier National Monument rangers through an agreement between the National Park Service and the Department of Energy. Other Lab trails may be monitored by the Laboratory's Protective Force. You are required to acknowledge and comply with law enforcement requests and directions. The following activities and items are strictly prohibited on Laboratory trails.